Sara Jane Glendinning is a multi-instrumentalist and vocalist who comes out to the SafeHouse Experimental sessions. She owns a Coach House where she hosts holistic, eco events. It’s also a great venue for concerts: very cosy with pin-dropping acoustics. 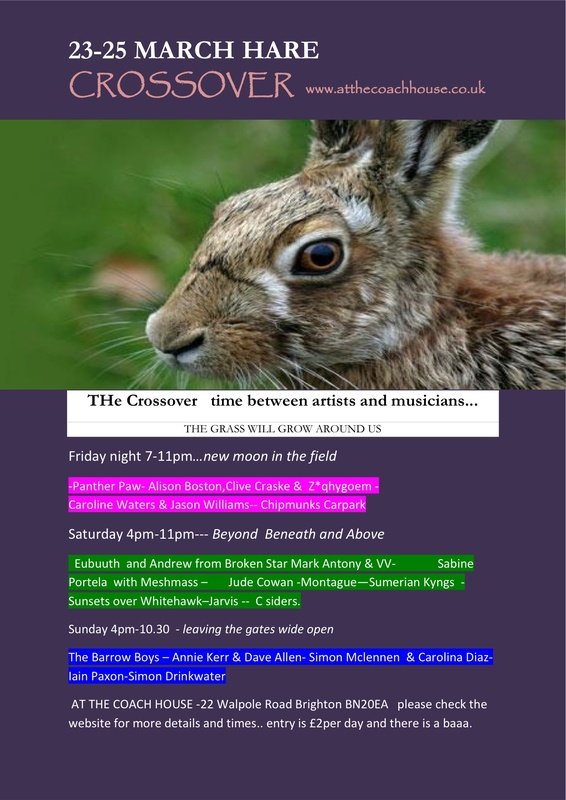 This weekend she’s hosting the March Hare Cross Over. About 15 acts, making for a total of 30-40 musicians will be playing. Each act will improvise with the preceding and following acts, making for constant music. I’ll be performing this evening. Here’s the poster: The Coach House also offers Bee Keeping workshops and Flamenco classes. Do visit the website and have a snoop round. Sara Jane has posted some great recipes, including one for Marmalade.